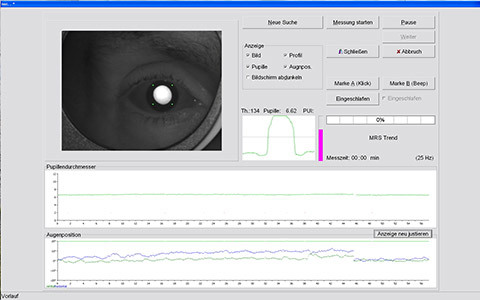 The Pupillographic Sleepiness Test PSTeco is an easy-to-operate, non-invasive and efficient tool to obtain an objective assessment to the central nervous activation (sleepiness) and a drug-induced state of alertness. The scope of the PSTeco is in sleep medicine, occupational health, pharmacology, medical negligence, legal medicine, neurology and psychology. 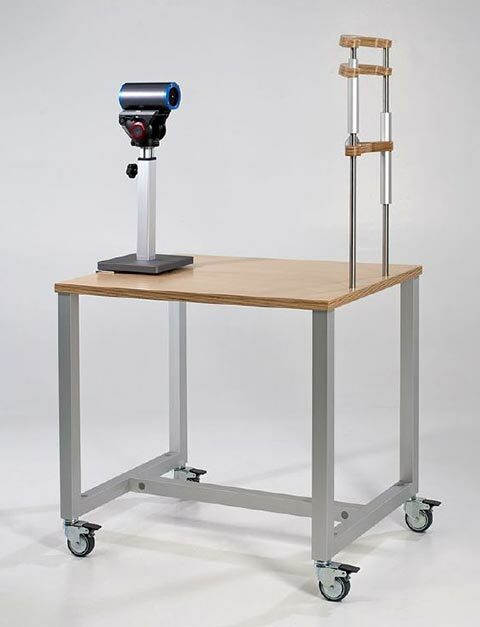 The PSTeco is most suitable for the use in the clinic, at the workplace and in the laboratory. 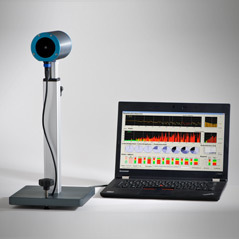 Some 20 years of experience in building systems for measuring eye and pupil movements influenced the development. The PSTeco comes in a well designed and robust plastic case for transportation and stowage. The PSTeco is the ideal tool for screening, diagnosis and therapy, as well as for the establishment of an expert opinion of the existence of sleepiness frequently occurring in conditions such as sleep apnea, narcolepsy, restless leg syndrome and insomnia. The system also provides useful information about the mental work load in general and e.g. of shift workers and personnel in high-risk occupations (such as pilots, professional drivers, power station operatives and production line workers). Interested? Make an appointment for an online live presentation. The sleepiness waves are monitored by means of a video camera with built-in infrared illumination (see picture to the left). The person being tested wears a pair of goggles which are transparent for infrared light only. The goggles shield the eyes from any residual and visible light and only a dimmed red spot is visible for fixation. The pupil diameter is recorded up to 11 minutes. From this data the pupillary unrest index PUI® is calculated. The PUI® is a quantitative value which describes the amount of the pupillary fluctuations in darkness as a measure of sleepiness. The PUI® is compared with reference values and no further data evaluation is needed. The coloured protocol gives additional, valuable information about the PUI® and pupil diameter over time, blinking and the data quality. Recording the spontaneous and involuntary pupil movement in darkness is the easiest method to measure and evaluate sleepiness objectively. Characteristic pupil diameter changes, so-called fatigue waves, are found in sleepy subjects (bottom trace). In alert subjects a constant pupil size in darkness is observed (top trace). Robust plastic case with: Infrared video camera on a post with integrated frame grabber, medical power supply for camera and frame grabber, fire wire card bus PC card, fire wire cable, PSTeco-software on CD, infrared goggles, manual.